Ultega 7-Piece Pilates Set 70% OFF - Only $15.07! You are here: Home / Great Deals / Amazon Deals / Ultega 7-Piece Pilates Set 70% OFF – Only $15.07! Ultega 7-Piece Pilates Set 70% OFF – Only $15.07! Here is a HOT deal on the Ultega 7-Piece Pilates Set! Right now, you can get it for 70% Off on Amazon – Only $15.07! Plus, Super Saver Shipping will be FREE with an order of $35 or more, or your can get FREE 2-day shipping with Amazon Prime. 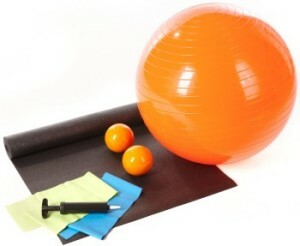 Set includes a 26-inch Gym ball, 8-inch Hand pump, 2 Weight balls 4.4 pounds, a Yoga mat (0.14 x 24 x 68 inch),Latex band (0.02 x 5.9 x 47 inch), and Latex band (0.14 x 5.9 x 47 inch).